On a chilly, gray Worcester day, inside an Atwood Hall rehearsal space children call “¡Hola!” warmly to one another as they run through the door, flinging their coats onto the floor in a colorful heap. 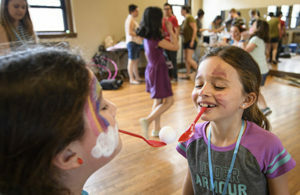 They’re rushing to grab a snack and join the group of Clark University student volunteers gathered in the space filled with salsa music and Spanish chatter for an afternoon of fun. Herencia y Cultura Hispánicas brings children together with Clark undergraduates to play games and speak Spanish. What appears to the nine children as two hours of games and laughter is much more than that. The program they’re attending is Herencia y Cultura Hispánicas (HCH), or Hispanic Culture and Heritage. Through play, Spanish-speaking children and Clark undergraduates alike are exposed to, and celebrate, a diverse variety of Spanish cultures and accents. Dolores Juan-Moreno, visiting assistant professor of Spanish, got the idea for the program after encountering a shy, young Spanish speaker in another Clark program. The girl was very quiet during a session conducted in English. When she realized that Juan-Moreno was a native speaker of Spanish, the girl began speaking in Spanish, saying that it was great to talk to someone in her language because she had little opportunity to do so in her daily life. So, gathered around a table in the Academic Commons on a summer Saturday morning last year, Juan-Moreno and Clark students Celia Ringland ’17 and Maggie Foster ’18 created Herencia y Cultura Hispánicas. Their goal is to connect Worcester students from all parts of the Spanish-speaking world to share common experiences and culture through their language. Juan-Moreno and the 11 student volunteers, who organize and plan the program without earning course credits or compensation, drew up the mission, concept, guidelines and expectations last fall. Juan-Moreno received a personal grant for supplies to run the program. The group built a website and organized into teams to promote HCH. In February, they held their first gathering for nine children between ages 8 and 10 conducted entirely in Spanish. 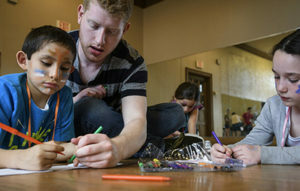 Volunteers spend an hour each Thursday gathered around a table in Estabrook Hall stacked high with arts and crafts supplies planning the next week’s activities. Recently, they discussed holding an outdoor scavenger hunt and talked about how the children have grown more comfortable interacting with the Clark students since the program began. “We’re offering them the perfect environment to share our culture and learn from each other,” Juan-Moreno says. and non-native speakers of Spanish. While some of the volunteers – who major in a variety of areas, from biology to international development to media, culture and the arts – are native speakers, others learned to speak Spanish in school and perfected it during Study Abroad experiences in Argentina, Ecuador, Costa Rica, Chile and Spain. All of them believe it’s important to boost the children’s confidence. During a recent afternoon program, the volunteers jumped into a full slate of activities, each addressing different learning styles. First on the agenda were movement exercises with guest speaker Chelsea Viteri ’16, a fifth-year student in the community development and planning master’s program. For about 40 minutes, Viteri energetically connected Spanish vocabulary and conversation with dance and acting. At one point she asked the children to imitate the movements and noises of their favorite animals, which included dropping to the hardwood floor to pretend to be a slithering snake. A game followed where the children and volunteers separated into two teams and had to represent a word Viteri called out. When tortuga, or turtle, was announced, each team member morphed into part of a turtle’s shell, head and legs as they raced across the room, winded and giggling the entire time. The afternoon continued with drawing, a bingo game in Spanish and a few rounds of Patata Caliente, or Hot Potato. The children became more excited with each game, speaking animatedly in Spanish. When they or the volunteers didn’t know a word, they asked others who supplied it. It was exactly what the volunteers and Juan-Moreno wanted to see happen – a natural strengthening of a common experience around language and culture. “It’s hard not to be excited when the kids are involved,” says Maggie Foster ’18, who helped facilitate some of the afternoon’s activities. Juan-Moreno says the program is slated to become a class next semester and hopes to see it expand to students in all Worcester schools. With room to accommodate 20 children, the volunteers are making postcards and flyers to engage more students beyond Main South next fall. Juan-Moreno is excited about the future after having received several thank-you emails from parents praising the volunteers’ efforts.